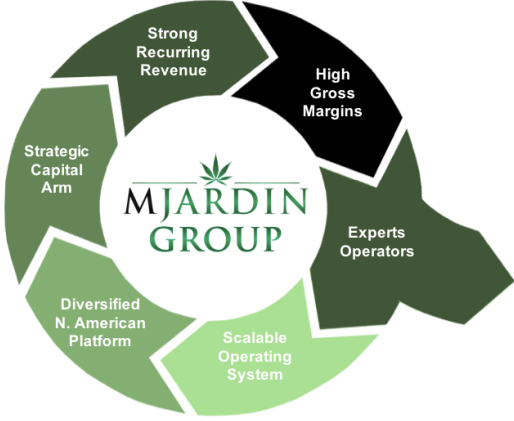 MJardin is managing and developing a North American portfolio that includes 19 cultivation facilities, two outdoor grow operations, four processing facilities, and nine retail and medical dispensaries. That portfolio is capable of producing 55,000 kilograms of cannabis flower per year. Historically, MJardin earned income primarily from management operations provided on an agency basis, whereby contractual obligations were based on specific performance criteria agreed to by the licensed facility owner. Under such management agreements, the company generally would oversee all aspects of the dayto-day operations of each facility. In addition, the company provides license owners with advice with respect to the design, construction, equipment purchases and build-out of new or renovated facilities, assistance with the refurbishment of facilities, support and advice with respect to information technology systems and database applications, and a centralized purchasing system for goods and services. For providing these services, Mjardin typically receive a variety of fees, including baseline management fees, performance-based incentive fees (where legally permissible), and other administrative support fees including staffing fees, technology fees, and reimbursable costs. The base fee usually is calculated as the total cost of production and operations – namely, labor and materials. Incentive fees typically are based on the facility’s production volume or other royalty mechanisms and are charged to the extent permitted under State and local laws, rules and regulations. A significant benefit of taking a strategic principal position in facilities MJardin manages is the ability to independently evaluate and make investments in, or advances in respect of or to owners of, cannabis licenses and licensed facilities. The company operates the investment arm through MJardin Capital LLC (“MJardin Capital”), a wholly-owned subsidiary of the Company, whereby 100% of the economics flow to the parent organization. The fluid collaboration amongst the senior cannabis management team and investment professionals at MJardin Capital allows for unique investment deal access, expert evaluation and ongoing professional management of licensed facilities. The company believes that by injecting strategic growth capital into licensed facilities that it can professionally operate on a turnkey basis, the Company can achieve an enhanced revenue stream for the parent organization. The aforementioned financial return may be in the form of interest, dividends, management fees or other streams of cash flow, adding significant value to each facility location, in turn adding significant value to the Company’s overall enterprise value. To further capitalize on the company’s value in legal cannabis markets outside of the U.S., the company licensed its intellectual property and entered into a management services agreement with GrowForce to operate and manage their cultivation, processing and retail facilities on an exclusive basis globally outside of the United States. In addition to fees for site design, construction oversight, equipment purchases, and the build-out of new or renovated facilities, MJardin will receive license fees, staffing fees and production-based royalty fees from GrowForce for services provided in the ongoing management and operation of their facilities.